With the new environmental requirements, the ductile iron industry looks to improve its combustion systems. Fives is well positioned to address the needs given its long history of serving this industry with an emphasis on improving production of new or existing assets. The ductile iron industry went through a major capacity downsizing following 2008, shuttering nearly 30 percent of their capacity. The industry relies on housing starts along with the municipal repair and expansion of their infrastructure. All of these markets are now pointing up driving a push to start adding back capacity and bring existing plants in compliance with stricter EPA rulings. There is also the need for stronger, longer, and lighter piping systems. 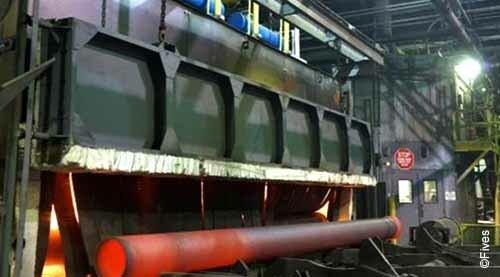 The industry looks to improve performance across a wide range of thermal systems including cupolas, thermal oxidizers, holding furnaces, scrap preheaters, ladles, AOD vessels, refractory dry-out systems, mold ovens, sand reclamation, preheating units, heat treating / annealing furnaces, cement lining ovens, and coating lines. The drivers for investment are to be able to meet the demand, lower system costs by increasing pipe lay lengths, improve fuel efficiency, lower CO2 emissions, and improve structural strength and thinner wall thicknesses. Fives offers a wide range of superior solutions to address today’s drivers. A few of the unique North American system features by Fives can result in improved up time, increased throughput, lower scrap rates and rework, reductions to required labor per product ton, better fuel efficiency with lower maintenance costs, and compliance with regulatory requirements. North American products offered by Fives for these applications include continuous pipe annealing ovens (50 mm to 1500 mm), rotary, inline, batch annealing ovens (pipe and fittings) and enameling ovens with burners management. To ensure throughput and up-time, reductions to required labor per product ton, better fuel efficiency with lower maintenance costs, and compliance with regulatory requirements, Fives offer a variety of s control solutions as part of its solutions. Fives designs auxiliary systems for the thermal oxidizers, the heat reclamation, ladle systems, scrap preheaters, coating systems, refractory systems and regulators. Fives brings its expertise and services to supply tailor-made solutions and ensure an optimal performance and up-time of the installation, turnkey retrofits, furnace line modernization, process maintenance, code compliance and the construction rebuilds.